How did Edward Leedskalnin build Coral Castle? In the late 1800s, Edward Leedskalnin left his Latvian home and came to North America. The love of his life, 16-year-old Hermine Lusis, had jilted him on the eve of their wedding because she had decided that, at 26, he was too old for her and too weird. Brokenhearted and dejected, he turned his back on Latvia to build a new life across the Atlantic. After several years of wandering across Canada and the United States, he contracted tuberculosis and came to Florida for his health, buying a small acreage in Florida City, a few miles south of Homestead. There, in 1923, he began building Rock Gate Park, using massive blocks of coral to fashion huge tables, chairs, couches, fountains, and pillars. Coral weighs 125 pounds per cubic foot and is difficult to work with. Leedskalnin was 5 feet tall and weighed 100 pounds, and yet he was able to extract coral from the ground, carve it into a myriad of shapes—like a 3-ton table in the shape of Florida—and move the objects around the grounds of the park. He worked at night, in secrecy, with no help, using the most fundamental of tools. In 1937, with development threatening the peace and quiet of Rock Gate Park, he moved his creations north to a 10-acre plot of ground near Homestead. Neighbors saw him transporting his sculptures on a heavy trailer pulled by a borrowed tractor, but no one ever saw how he loaded them. In this new location, Edward built what he called the Coral Castle, a two-story tower house using 235 tons of coral. The gate to his sanctuary was made of 9 tons of coral and was so perfectly balanced that it could be opened with one finger. As he had earlier, he worked at night, in secrecy, and no one ever saw how he managed to extract the gigantic blocks of coral from the ground, carve them, and lift them into position. Some believed he had supernatural help. Some thought he used witchcraft. The fact is that, even though he had only a fourth-grade education, he studied physics, astronomy, and geology throughout his life and was an outstanding engineer. 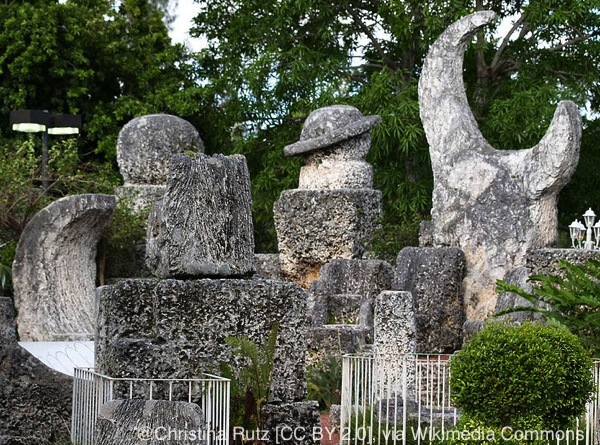 He died in 1951 from cancer, but some believe that Edward stayed on at his beloved Coral Castle. Several psychics claim to have conversed with him; many feel the powerful energy that exudes from the place. One visitor took pictures, which, when developed, showed figures that were not there when he snapped the photos. 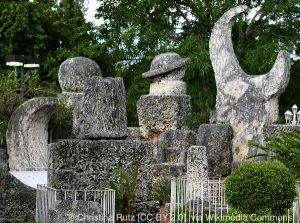 Whether or not Coral Castle is haunted may still be open to question, but its construction will forever be shrouded in mystery. 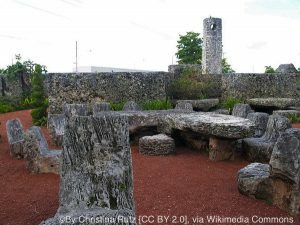 Ready to visit Coral Castle? Check out the website for information. 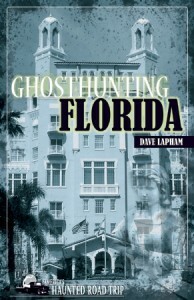 You may think that Florida is all about Mickey Mouse; however, in his book Ghosthunting Florida, author Dave Lapham proves that the state is fertile ground for entities even more fantastic than a talking mouse. The book is a spine-tingling trip through Florida’s small towns and lively cities, its historic sites and fun spots, all of them haunted.